Come one come all and meet the winners! The Greatest Show on Earth has roots right here in Wisconsin. The Ringling brothers started their circus in Baraboo in 1884, later joining with Barnum & Bailey in 1919 to create Ringling Bros. and Barnum & Bailey Combined Shows. When a circus, a fair or a carnival came to town, it was cause for celebration. We think the results of the Best of Madison readers poll are cause for celebration, too. 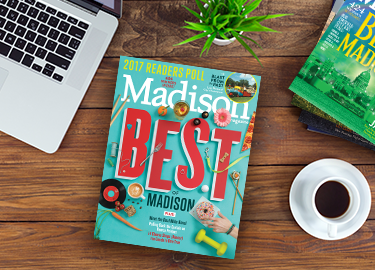 Each year, Madison Magazine reveals the best the city has to offer as chosen by you, our readers. Step right up to find out which businesses, people and places were voted to the (big) top of our 38th Annual Readers Poll. If you missed out on casting one of the 180,000 total votes in this year’s poll, you can still be a part of Best of Madison throughout the year online. Follow us on Facebook, Instagram and Twitter for more Best of Madison. We want you to be a part of the fun, so celebrate this year’s winners by tagging Madison Magazine in your photos and using #BestofMadison2019 on social media. Didn’t see your favorites win this year? Nominations for the 2020 Best of Madison poll start in August. ★The Great Dane Pub & Brewing Co.
★Chocolate Shoppe Ice Cream Co.
Our knowledgeable and passionate bar staff connects the art and science of distillation to beautifully designed, balanced cocktails. Our goal is to make cocktails that are approachable, delicious, and presented to you in a fun and educational manner. The Cocktail Lounge features our gin, vodka, coffee liqueur, aquavit. Our whiskey and apple brandy are currently ageing and will be ready for all to enjoy in the not-to-distant future. At State Line, each ingredient in every cocktail has been meticulously crafted using only fresh, whole ingredients, which we believe results in a better drink. The spirits used are exclusively our own, distilled on site, providing us a unique opportunity to create cocktails that can only be found in our lounge. Gather round the table, back patio, or bar and enjoy a different kind of cocktail experience. Since opening in the 1960s, Le Tigre Lounge has been an iconic spot in the city not only for its tiger-themed décor, but also for its anti-swearing policy. ★Spotted Cow, New Glarus Brewing Co.
★Commuter Kolsch, One Barrel Brewing Co.
*As of March 1, Plan B is now Prism Dance Club and has partially new ownership. The mission of the Madison Symphony Orchestra (MSO), is to produce high quality concerts of orchestral, instrumental, vocal, and choral music, to educate and entertain audiences of all ages in the Madison area and beyond, and to advocate music as a universal language of expression and understanding. The MSO celebrates its 93rd season and Music Director John DeMain’s 25th anniversary in 2018-2019. Hailed as “a gifted orchestra builder” by The New York Times, Maestro DeMain has grown the Symphony to be one of America’s leading regional orchestras. Our MSO Education and Community Engagement Programs bring the joy of music to more than 25,000 children and adults annually. These programs are consistently recognized by national agencies including the National Endowment for the Arts, the League of American Orchestras and the Society for the Arts in Healthcare. As a resident company of the Overture Center for the Arts, we call Overture Hall home to all MSO concerts, and all performances featuring the MSO's Overture Concert Organ. Joined by the world’s leading guest artists, we are proud to present performances designed to delight your ears and deliver an acoustical experience unlike any other in this world-class concert hall. The MSO’s new 2019-2020 season of symphony concerts and organ performances begins in September 2019, and continues through May 2020. Subscriptions are available starting in March 2019 for five or more symphony concerts, and four organ performances. Single tickets go on sale in August 2019. Join us for the Journey! The MSO presents a subscription concert series featuring triple performances (Friday, Saturday, Sunday) in Overture Hall from September through May. These concerts bring major and emerging guest artists of international renown to Madison along with some of the greatest and most popular works in the classical repertoire. As the only professional symphony orchestra in south central Wisconsin and as one of America’s premier regional orchestras, MSO contributes to the artistic, cultural and financial vitality of Madison and Dane County. As the resident orchestra of Overture Hall, MSO is a valuable asset for local businesses, schools and the community as a whole. The Overture Concert Organ was commissioned by the Madison Symphony Orchestra. This 174-ton, 4,040-pipe marvel is the stunning backdrop for all MSO concerts in Overture Hall. To broaden the Symphony’s reach in the community while celebrating this amazing instrument, the MSO offers an annual series of free and ticketed events, including recitals with major guest and local artists, free Community Hymn and Carol Sings, free Farmers’ Market Concerts, as well as master classes and other educational events. The MSO is dedicated to providing outstanding educational and community engagement opportunities throughout south-central Wisconsin. We engage music enthusiasts of all ages and abilities through our partnerships with schools, community centers, and assisted living facilities — including Young Artist Competitions, Young People’s Concerts, Up Close & Musical®, HeartStrings®, Meet the Musician, and other programs that have a positive impact on people’s lives. A quote by Aristotle...We are what we repeatedly do. Excellence then, is not an act but a habit. These are words that I truly believe in. It is my goal to provide nothing short of excellence in quality and service. Fashion is fun—and local—at The Purple Goose, which offers an eclectic collection of clothing, accessories and gifts in a gorgeously restored 1840’s brick house in downtown Verona. Where modern style meets hometown charm, you’ll discover trendy pieces and everyday staples that you’ll reach for again and again. ★Best Cleaners of Madison Inc.
★Lake Mills Cleaners & Dyers Inc.
SSM Health at Home offers a range of services — all with one goal — to keep our patients as safe and independent as possible at home. Our wide range of services allows us to provide more comprehensive care as well as a seamless transition should our patients need to move from one service type to another. Through home health, palliative care, hospice, medical equipment, and a range of community services, we are able to support patients throughout their health care journey with a high level of quality care. The home health team collaborates with physicians to develop an individualized plan of care for each patient. Our goal is to help our patients remain at home whether they are recovering from an illness or injury, dealing with a chronic condition or healing from surgery. Palliative care is available for those facing chronic or life-limiting illnesses. Care focuses on relieving symptoms, pain and stress, helping patients achieve the best quality of life possible. Palliative care is not dependent on diagnosis or life expectancy and can be provided alongside curative treatments. Hospice is a special type of care for those who have a limited life expectancy and have chosen to stop curative treatment. Our goal is to help patients achieve the best quality of life possible, managing symptoms, pain and anxiety while providing emotional and spiritual support for patients and their loved ones. We also provide a variety of medical equipment, supplies, and services. We have a number of retail stores in the area, including a location in Madison, where specialists are available to assist in navigating insurance requirements on prescribed equipment. SSM Health at Home also offers a number of community services. VoiceCare is a personal emergency response system which establishes a connection to help, should the need arise. Meals On Wheels delivers nutritious mid-day meals for homebound seniors living in Madison, Middleton, Monona, and Sun Prairie. SAFE at Home provides in-home safety assessments and medication reviews for Dane County residents age 60 and older. Informational visits are available to anyone who would like to learn more about how SSM Health at Home services can help. We are here to listen to your concerns and work with you to help provide the care you or your loved one need to remain as safe and independent as possible at home. ★Gorilla Movers of Wisconsin Inc.
Over 20 years of experienced dog and cat grooming! Locally owned and operated. Services include full or mini groom, bath, nails, teeth brushing, Furminator and skin treatments. We have Brewers, Cubs, Badgers, Packers and Bears Bandanas! Our animal hospital offers preventative care, general medical and surgical care for small animals, with a primary focus on dogs and cats. Dr. Sondel also specializes in canine reproductive care, and you can view the adorable results in our Nursery photos on our website. Your experience at Sondel Family Veterinary Clinic — a six-time Best of Madison winner — begins with a warm welcome for your furry family member and a reassuring smile for you. Here your pet will receive top quality care and you’ll receive the information you need to help your pet live the fullest and healthiest life possible. The University of Wisconsin Golf Course, University Ridge, is the home of the University of Wisconsin Men's and Women's Golf Teams. Annual events include the PGA Tour Champions' American Family Insurance Championship (hosted by Steve Stricker), WIAA Boy's and Girl's State Championships, collegiate Badger Invitational, and many more. University Ridge is designed by Robert Trent Jones II and is yours to play without a costly membership. Visit our website at UniversityRidge.com or call us at 608.845.7700 to reserve your next tee time. Play where the Badgers Play, University Ridge! Lagree is the most innovative full body conditioning fitness method and it can only be found at REFORMADISON in Wisconsin. Accept no imitation and allow us to prove how effective, safe and fun the Lagree Method is! The Revolutionary Fitness system combines strength, endurance, cardio, flexibility and stretching in each move. That means a 50 minute REFORMADISON workout will push you beyond what you thought was even imaginable. Using weighted springs and a moving carriage, the ingeniously designed and patented Megaformer demands intense core engagement, constant tension of your muscles and mega-mental focus allowing you to reach maximum exertion and results in each class. If it isn’t shaking, it isn’t working. At REFORMADISON, you are our top priority. Class sizes are intentionally small (10 or less people) to make sure YOU are reaching a physical place that will provide you with real results. Yes, you will shake. Yes, you will sweat. Yes, you will question your abilities. But ultimately, you can do this. We will ask a lot of you; you have to want to REFORM. That’s why we offer 50 minute classes that have been proven to burn 500 to 800 calories. By targeting and constantly challenging the fat-burning, slow twitch muscles, we can push you to maximum exertion in minimal time. Contact Award Winning Trainer Katie Frank today for a special introductory offer so you can give this life altering fitness craze a try!